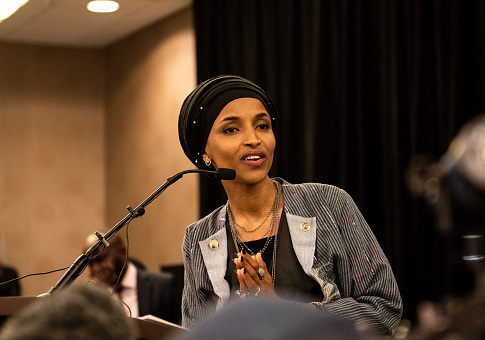 Minnesota Democrat Ilhan Omar told Muslim Girl magazine that she "believes in and supports the BDS movement," adding that she has fought to ensure others are also able to openly support the movement. Omar, who was elected to Congress in the 2018 midterms, will be the body's first member to openly support the movement to Boycott, Divest, and Sanction Israel. Omar, a Muslim and a Somali-American refugee, was elected to replace Rep. Keith Ellison (D., Minn.) in the state's 5th Congressional District. Ellison was the first Muslim elected to Congress. "Ilhan believes in and supports the BDS movement, and has fought to make sure people’s right to support it isn’t criminalized. She does however, have reservations on the effectiveness of the movement in accomplishing a lasting solution," her campaign told Muslim Girl in a feature published on Sunday. Omar has often come under fire for her harsh criticism of Israel. She has faced allegations of anti-Semitism after incidents like one in 2012 when she referred to an "apartheid Israeli regime" in a tweet and said "Israel has hypnotized the world, may Allah awaken the people and see the evil doings of Israel." In an opinion piece for the New York Post, David Harsanyi, a senior editor at the Federalist, said that for Omar "to accuse the only democratic state in the Middle East, which grants more liberal rights to its Muslim citizens than any Arab nation, of being an ‘apartheid regime' is, on an intellectual level, grossly disingenuous or incredibly ignorant." Omar says her disdain for Israel is not religious hatred towards Jews but rather the politicians in power in the country. When referring to Islamaphobic rhetoric she herself has faced, she told Teen Vogue, "I don’t really give space to people who are attacking me based on my identities." In 2017, as a Minnesota state legislator, Omar voted against a bill aimed to deny life insurance payments to any person convicted of aiding or committing terror acts. The bill ultimately passed and was signed into law. Omar ran for Congress on a platform of Medicare for all and abolishing Immigration and Customs Enforcement (ICE). She beat her Republican opponent, Jennifer Zielinski, handily in the solidly blue district. The district, which includes the entire city of Minneapolis, hasn't elected a Republican to Congress since 1962. Ellison, the district's outgoing seat holder, overcame allegations of domestic abuse from a former girlfriend to be elected the state's attorney general. This entry was posted in Politics and tagged BDS, Ilhan Omar, Israel, Keith Ellison, Minnesota. Bookmark the permalink.